Product prices and availability are accurate as of 2019-04-14 12:04:57 EDT and are subject to change. Any price and availability information displayed on http://www.amazon.com/ at the time of purchase will apply to the purchase of this product. 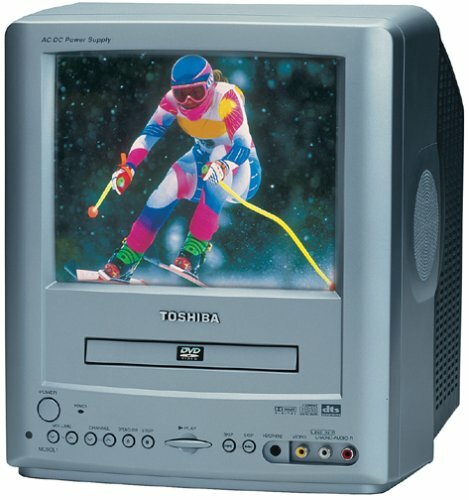 This full-featured 9" Toshiba TV and DVD player combination is ultra portable for use in home, vehicle and office. Featuring a 181-channel tuner, HiFi digital surround and stereo TV sound, it has convenient front panel AV inputs for easy connection of video games, video cameras and more. The coaxial digital audio output provides connectivity to Dolby Digital and DTS systems, while the headphone jack allows for individual listening. The included DC car cord provides convenient operation in a car, RV or boat. No. MD9DM1. 12Hx11Wx12-1/4D". 17.6 lbs. Tv/DVD AC/DC Combo DC Car Cord Included Front A/V Inputs Headphone Jack The MD9DM1is equipped with coaxial digital audio output for connectivity to Dolby Digital or DTS systems.